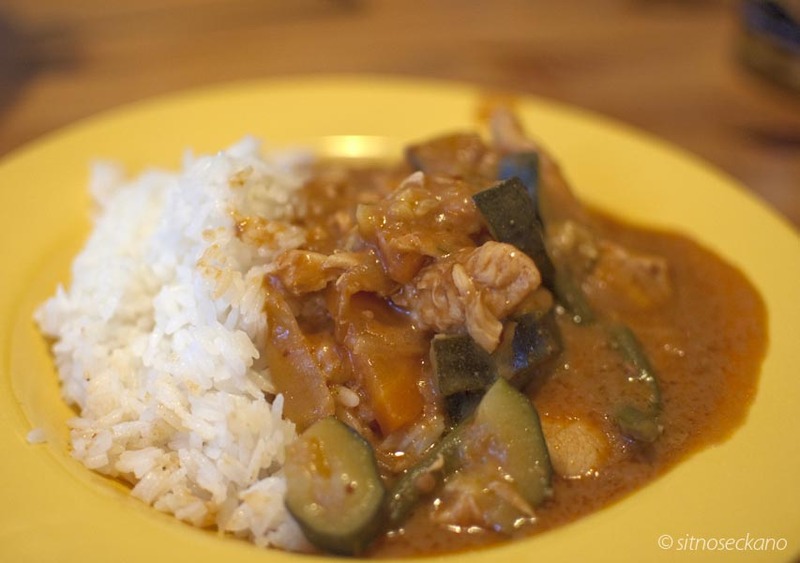 This recipe is for everyone who has regularly eaten lunch at the ‘Special Fork’ and counted the days and hours til Friday ……. for everyone who was joyfully tucking in with a spoon in that beyond delicious plate of rice, beans and fried plantains and wondered whether they should order another one right now. To call this dish sublime would not be an exageration for all those Friday lunch devotees and, if they are far far away from the ‘Fork’, I hope they like the recipe and decide to recreate that simple yet fantastic pleasure in their own kicthens. Before we begin, a disclaimer. I got the recipe from my gracious mother-in-law, an amazing cook, but I adapted it for our own taste. I don’t like scotch bonnet peppers myself, so I left them out (I also think the Special Fork does not use them in this dish), so the recipe may not be absolutely authentic, but it is nevertheless a fantastic Sierra Leonean meal. If you can take the scotch bonnet heat, by all means, go ahead. Soak your beans overnight covered in water. Drain and rinse, then cover with water in pot and bring to boil. Discard the water once it has been boiling for a minute or 2. 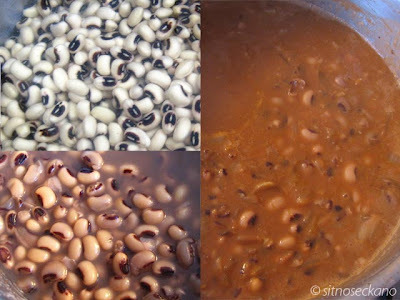 Fill pot of beans with fresh water and bring to boil one more time. Lower temprature and simmer for at least 2 hours (ours took around 2 hours 15 min) until soft, as in the second photo above. Chop onions coarsley, add oil, and fry on low heat for about 15 minutes. 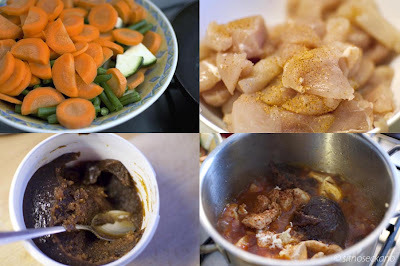 Add maggi cubes, tomato paste, cayenne (or a whole washed scotch bonnet pepper – do not chop it), salt and pepper. Fry for another 10 minutes or so. 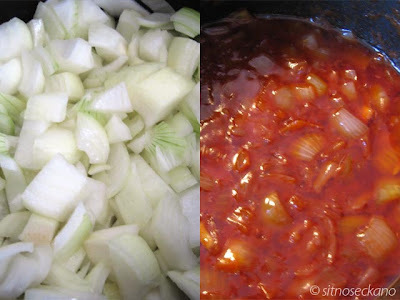 Once the onion mixture is ready and the beans are cooked, add the onions to the pot of beans. 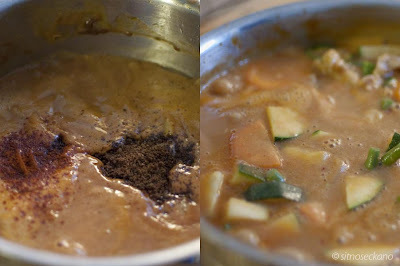 Mix and crush around 1/3 of the beans with the back of a wooden spoon, and simmer together for 15-20 minutes. The beans will thicken considerably once they cool a bit. Peel and chop the plaintains. Heat up a frying pan with about half an inch of oil. 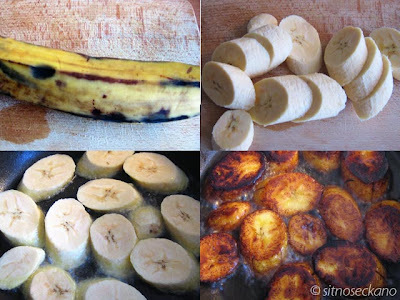 Fry plantains for couple of minutes per side. Remove and sprinkle with salt. 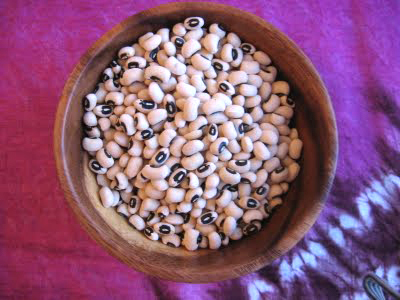 Serve beans with steamed white rice and fried plantains on side. Star beer not included.